Combine salt, cumin, cayenne, cinnamon and nutmeg in a small bowl. 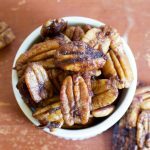 On medium heat in a cast iron pan, heat pecans until slightly fragrant and toasted (about 5 minutes). Stir in butter and spices until well combined. Once the butter has melted, add in brown sugar. Once it has melted and the mixture has coated all of the nuts, pour out onto a cookie sheet with wax or parchment paper to cool.